Handles wide belts in one operation. FASTER, simpler lacer installation of wire hooks has been made possible with the introduction of a new roller lacer from Flexco . The Clipper Roller Lacer Gold Class, is a versatile portable tool designed for fast, easy, lacer installation, that reduces operator fatigue and minimises downtime without sacrificing precision. The lacer handles wide belts in one simple operation. It can be driven by a cordless drill (18-volt or higher) or operated manually with a handle or ratchet in emergency situations. The new lacer is approximately 300mm longer than the standard roller lacer, which allows for extra stability when placing it on sidewall pans for on-site installation. 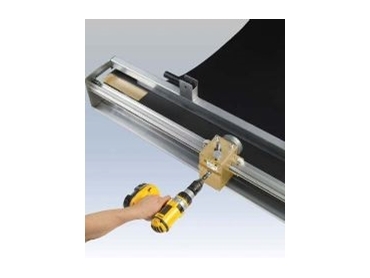 Available in widths of 600, 900, 1200 and 1500mm the tool features a special shelf that supports the belt and guides it into the hook points during installation. The belt shelf can be easily moved from an operating to a loading position for fast insertion of hooks and an improved belt clamp provides greater holding force for the belt. The newly designed face strip eliminates the need for a locking lever and back-up extrusions, reducing component wear and enhancing tool durability. Face strip storage slots enable the user to easily slide the face strip into the tool. Introduction of the Clipper Roller Lacer Gold Class expands Flexco's line of portable belt maintenance tools for efficient, economical repairs, and productive conveyor belt operation.